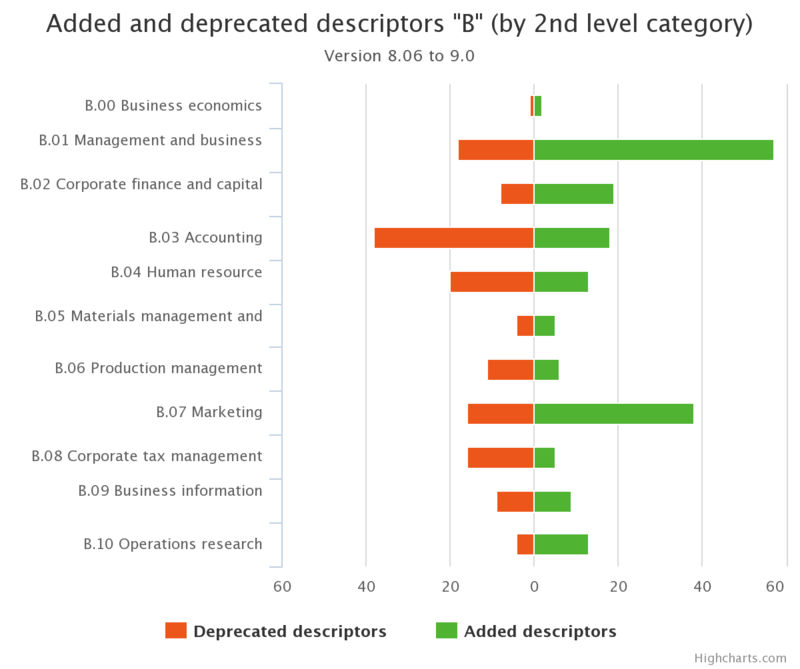 The resulting report, cached for better performance and availability, can be found in the change reports section of the STW site, together with reports on deprecation/replacement of concepts, changed preferrred labels, hiearchy changes, merges and splits of concepts (descriptors as well as the higher level subject categories of STW). The queries used to create the reports are available on GitHub and linked from the report pages. The method applied here to STW is in no way specific to it. It does not rely on transaction logging of the internal thesaurus management system, nor on any other out-of-band knowledge, but solely on the published SKOS files. Thus, it can be applied to other knowledge management systems, by its publishers as well as by interested users of the KOS. Experiments with TheSoz, Agrovoc and the Finnish YSO have been conducted already; example endpoints with multiple versions of these vocabularies (and of STW, of course) are provided by ZBW Labs. At the Finnish National Library, as well as the FAO, approaches are under way to explore the applicability of skos-history to the thesauri and maintenance workflows there. In the context of STW, the change reports are mostly optimized for human consumption. We hope to learn more how people use it in automatic or semi-automatic processes - for example, to update changed preferred label of systems working with prior versions of STW, to review indexed titles attached to split-up concepts, or to transfer changes to derived or mapped vocabularies. If you want to experiment, please fork on GitHub. Contributions in the issue queue as well as well as pull requests are highly welcome.